The Last Throes of PoMo Macro? That is to say, is Post-Modernist Macroeconomic Policy over? ” ….Postmodernism is largely a reaction to the assumed certainty of scientific, or objective, efforts to explain reality. In essence, it stems from a recognition that reality is not simply mirrored in human understanding of it, but rather, is constructed as the mind tries to understand its own particular and personal reality. For this reason, postmodernism is highly skeptical of explanations which claim to be valid for all groups, cultures, traditions, or races, and instead focuses on the relative truths of each person. In the postmodern understanding, interpretation is everything; reality only comes into being through our interpretations of what the world means to us individually. Postmodernism relies on concrete experience over abstract principles, knowing always that the outcome of one’s own experience will necessarily be fallible and relative, rather than certain and universal. From Ron Suskind, “Faith, Certainty and the Presidency of George W. Bush,” NY Times Magazine, Oct. 17, 2004. I’m not the first person to comment on the PostModernist tendencies of this Presidency — see in particular Josh Marshall’s 2003 Washington Monthly article, “The Post-Modern President”. However, I think this might be among the first to systematically dissect the post-modernist aspects of this Administration’s macroeconomic policies. I’ll tackle these points in turn. Do tax cuts increase tax revenues? 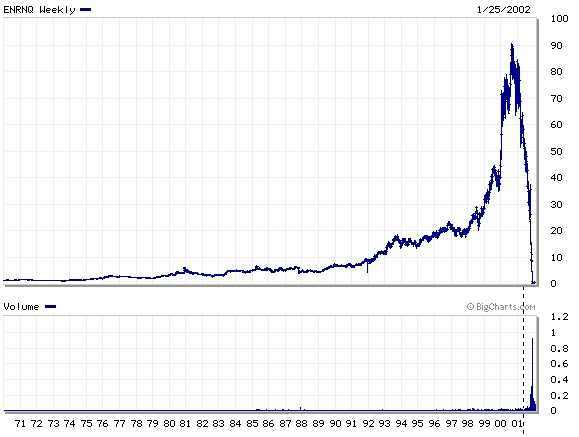 Is more financial deregulation always better? Macroeconomic aspects of energy policy. Do budget deficits have an effect on current account deficits? Do tax cuts increase tax revenues? This topic has recently been in the news, with Bruce Bartlett’s recent op-ed recounting the success of supply side economics, while disavowing the view that tax revenues would rise in response to a tax rate decrease (see the debate at Economists View , , , Brad Delong , and Angry Bear ). It is nonetheless important to recall that some people — including the Vice President — still believe that the response of tax revenue to decreases in marginal tax rates is very substantial. This in turn leads to there fervent belief that dynamic scoring would lead to big changes in how “good” tax cuts would look from a fiscal perspective. 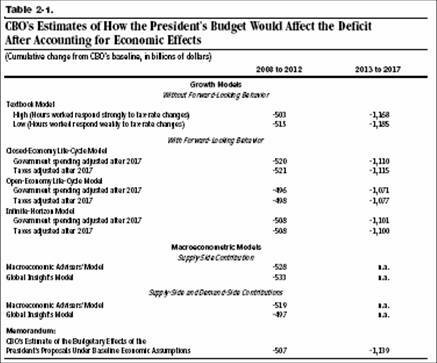 Yet, the CBO’s recent analysis of the President’s budget request has a little remarked-upon section (Table 2-1) which examines how CBO’s baseline, and models accounting for supply side effects, would differ from the OMB forecast. What is remarkable is how little the textbook supply side model response, with high responsiveness to tax changes, differs from the CBO’s baseline. The open economy change is -$496 billion cumulative change (2008-2012), versus the CBO’s standard model estimate of -$507 billion. In other words, it’s a cumulative difference of $11 billion, or roughly $2.2 billion in a projected 2012 economy of $17.2 trillion (i.e., 0.01% of GDP in 2012). Some might object, saying these are “just models”. Let’s look to the surging tax revenues in FY’06 and FY’07. I’ll ignore the declining state tax revenues (see NYT on this), and re-iterate the fact that the surge in revenues is well within the two standard error bands (see here). In any case, the CBO’s estimate of standardized/cyclically adjusted Federal tax revenues in FY’07 is still 1.4 percentage points of GDP lower than it was in FY’00. By the way, there is even doubt whether tax cuts increase GDP in the long run, a separate issue from whether tax receipts increase. The answer depends critically upon how the tax cuts are financed. This is discussed in the Treasury’s report, even though — as recounted in my post on the subject — this fact is often omitted from arguments of the proponents of dynamic scoring. Figure 3: Annual growth rate in OFHEO Housing Price Index and in index of transactions prices. Source: OFHEO March 1st release. Most economists would agree that when markets are competitive (in the textbook sense) and information is perfect (so that agents on both sides of the transaction have the same information set), regulation is usually counterproductive. However, when information is asymmetric — so that for instance lenders and borrowers have access to different information sets regarding motives, assets and liabilities — then regulation may be a second best way of managing what would otherwise be disappearing markets, or situations where the government is forced to enter in to bail-out systemically important sectors. 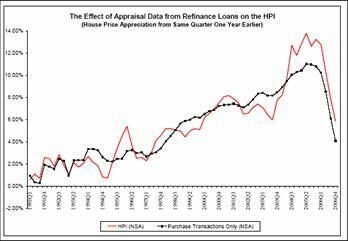 This was the subject of my recent post on the subprime collapse. “What is really frustrating about this is [federal regulators] don’t have enforcement authority to do anything with these state-licensed, stand-alone mortgage lenders,” says Fed Reserve Governor Susan Bies. Yet even where federal regulators have jurisdiction, they sometimes have been slow to grapple with the explosive growth in especially risky practices and quick to shield federally regulated banks from states and private litigants. The underlying belief, shared by the Bush Administration, is that too much regulation would stifle credit for low-income families, and that capital markets and well-educated consumers are the best way to curb unscrupulous lending. Public disciplinary actions by federal bank regulators are rare. In the past two years, the FDIC has issued four cease-and-desist orders against subprime lenders that required the companies to change their practices. The Fed has issued just one and the OTS none, the FDIC said. The OCC said it has sanctioned one subprime lender in that time. Federal regulators say they spot and correct problems quietly during the examination process before they reach the point where public enforcement action is needed. Regulators appointed by President Bush often have been more sympathetic to industry concerns about red tape than their Clinton administration predecessors. When James Gilleran, a former California banker and bank supervisor, took over the OTS in December 2001, he became known for his deregulatory zeal. At one press event in 2003, several bank regulators held gardening shears to represent their commitment to cut red tape for the industry. Mr. Gilleran brought a chain saw. Now it would be irresponsible to place the entire blame for the subprime collapse at the feet of the Bush Administration. Financial innovation — partly to avoid regulation — is a recurring theme in American economic history (see for instance Mishkin’s money & banking textbook). In addition, divided responsibility between state and Federal authorities is part of the problem. But certainly the deregulatory zeal could not have been helpful. It is against this backdrop (and the ongoing discoveries of further financial irregularities in accounting and the granting of stock options) that I find the current attempt to “reform” Sarbanes-Oxley puzzling. That economist was Ben Bernanke (“Nonmonetary effects of the financial crisis in the propagation of the Great Depression,” American Economic Review 73(3)). Macroeconomic aspects of energy policy. As noted previously, the President has recently argued for dealing with “oil addiction”. However, as was also highlighted, the President’s convictions extend only to devoting more resources to R&D and continuing subsidization of ethanol production. Strangely — for a President supposedly devoted to market-based approaches, gasoline — or energy taxes more generally — are nowhere to be seen. Now, I do not argue that it is either feasible or desirable to hit zero energy imports. Indeed, even if we were to be net zero oil importers, upward shocks to oil prices would still put upward pressure on economy-wide prices, thereby exerting contractionary effects on output. But, it’s clear that our present dependence on imported oil adds another layer of vulnerability to oil price shocks, insofar as they redistribute income away from the US and to oil exporting nations. Were those nations to exhibit roughly the same marginal propensity to consume as do Americans, then the net effect on world output would be small (some will recognize this as the “transfer problem” discussed by Keynes and Ohlin in the context of the Treaty of Versailles). But they have not thus far (see Brad Setser‘s various posts on this subject), thus subjecting the world economy to various imbalances (see also here). Let me lend a personal note to this discussion. As one of the professional staff of the CEA held over from the Clinton Administration, I had the opportunity to sit in on some of the meetings of the (staff level) working group of Vice President Cheney’s National Energy Policy Development (the Report is here). While we were admonished to “think outside the box”, one will find absolutely zero mentions of gasoline tax in that report, as well as the 2006 Economic Report of the President (by the way, this is why I’m wary of arguments of the sort that assert “the world is different now”). This is true despite the fact that when there are negative externalities, the standard (neoclassical) economists’ response to internalize the externality by way of taxes (see this post). As Jim Hamilton has argued, the way not to go, at least as a first resort, is via command-and-control means such as CAFE standards. And, to further critique the Administration’s approach to energy policy, it seems foolhardy to subsidize ethanol production when current oil prices make ethanol production profitable (see here and Jim Hamilton’s more recent post). And yet in Box 6-3 assessing “the link between fiscal and trade deficits”, the ERP authors cite favorably the Fed’s estimate of an elasticity between fiscal and trade deficits of 0.20, directly contradicting the previous statement. I might further observe that the quote from the 2006 ERP does not jibe with the Treasury’s (more nuanced) Occasional Paper on the topic, entitled The Limits of Fiscal Policy in Current Account Adjustment. Then the question is how big is the effect; there reasonable people can differ. My empirical work suggests something between 0.15-0.44. For those skeptical of econometrics, well, between 2000 and 2005, there was approximately a 4.3 percentage point swing in the Federal budget balance, and a 2.2 percentage point swing in the current account balance. This outcome is consistent with a 0.5 coefficient. See also Figure 2 below. Figure 4: Change in the consolidated government budget balance to GDP ratio, lagged two years (blue) and change in the current account to GDP ratio (red), on a NIPA basis. Sources: BEA, NIPA release, February 2007 and author’s calculations. So, confronted with this evidence, will the reign of PoMo Macro be ended? It should, but there will always be those who will choose ideology over data. For them, they will continue to construct their own “reality”, and so, like in other dimensions, we have not yet seen the last throes. This entry was posted on April 13, 2007 by Menzie Chinn. The font after table 2.1 is smaller then normal and very hard to read. No, thank you — it was well worth reading. js: Nothing deep in the use of lagged two year changes in the budget balance to GDP ratio, other than the fact that it takes time for tax cuts and government spending to go through the Keynesian multiplier process. For instance, in a typical macroeconometric model (e.g., OECD’s Interlink), the maximal impact on GDP of a tax cut is two and three years after the cut, while for fiscal policy, it’s in years one and two. If two years seems a little long, shift it back a year, and you’ll still see something of a correlation. really identifies the self molestation…at least not ahead of his authority to demonstrate…luckily given the chance. I can tolerate PoMo in Art and even some critics, but gimme Suskin rather than Tarnas for a taste of this in public policy. Aspirational statements from our President without that empirical basis (the fact gathering process), despite that empirical basis (the unpleasant presentation of the facts), with no reference to past empirical bases (the people have spoken, but that was yesterday) is a clear case of irresponsible and, if the GOP did not own the media, impeachable government. #4. People arent that stupid. We had to suffer through quite a bit of #3 before we hit the outer limits of #4, and the pendulum began to swing back. If you actually read Mankiew’s paper you will find that he concludes that even with dynamic scoring a labor income tax cut recovers only 17% of the cut and a capital gains tax cut recovers only 50%. So even a supply-side advocate like Mankiew admits that tax cuts don’t come close to paying for themselves. Mankiew and the CBO only disagree as to the magnitude, not the conclusion. And it’s mutual: I don’t buy mankiw anymore. So, why is the Bush Adminstration quick to defend the “lending rights” of the low-income population, but hasn’t done anything to promote the “earning rights” of the poor (or anybody other than the ultras)? Sort of seems like the argument that too much zoning regulation deprives the poor from unabated access to booze, gambling and firearms and surely we can’t have that! Put simply the current supposedly “Postmodern” tendencies of the current government can be understood much more simply. This isn’t some “new” intellectual era boldly bypassing the rational empiricist classical modernist consensus out of some new theoretical construction. They just don’t care one bit WHAT are the objective facts (and as an unreformed classical liberal these do exist I assert), they care exclusively WHO wins and who loses. If it good for my My Tribe and bad for Them, I want it and if it’s good for Their Tribe, I fight it. Those things like ‘reason’ or ‘justification’ or ‘explanation’ or ‘truth’ or ‘testimony’ are just so much useless chum they laughingly throw out to the deluded rationalist throwbacks. One side is having a debate. The other side is looting. Well said DrChaos (but if I were one of your patients I would demand a name change) and now about the stage, –the media through which we are tormented by this spectacle, is there a point at which they throw in the towel (like Imus)[according to Reich] and proclaim this as clearly as you have? Does it take 3/4 (4/5?, 9/10?) of the population to bend the media horn to make an announcement like “Ok, this play was really about looting/corruption and not like the debate we were paid to advertise it as…you win.” The sinking voter participation rates go with the sinking credibility of the major networks. I’m enormously curious to know the identity of the “senior adviser to Bush” Suskind quotes. Characterizing his view as “post-modern” is charitable, imo: At best, it’s infantile; at worst, it’s insane. Because actions always have unintended consequences, the world that “history’s actors” create is never the world they intend – and since the “new realities” will never be the realities they wished for, history’s actors are soon reduced to being merely history’s reactors. jg: I have high regard for Greg Mankiw’s academic work. When I taught a PhD macro course, I always assigned his QJE menu cost paper (along with Akerlof and Yellen’s near rationality papers in QJE and AER); I also think his more recent work on sticky information with Reis is also important. Rather than undertaking a debate on the merits of Mankiw’s estimates, I’ll just refer you to the ongoing commentary on his post. Two key points made are (i) the CBO’s estimates are based on several models, not just the microsimulation model, and (ii) even with the higher elasticities, tax revenues still do not rise in response to a tax cut (Joseph‘s point). DrChaos: Like many things in the world, from a distance, there may be observational equivalence. I admit, you could make an extremely good argument for the “looting” hypothesis. However, I have often been struck by how fully some people in government and policy commentators can deceive themselves that something is true, all evidence to the contrary. So I have a modest conjecture — that at least some of these people truly believe what they say. In some ways, that is more disturbing than the idea that they are trying to deceive their audiences for self-interested reasons. calmo: Thanks for the compliment. I’m afraid “PoMo no mo” did not occur to me. I agree with you — I prefer my postmodernism in art rather than policy analysis. My apologies for my misspelling of Mankiw’s name above. The reason energy taxes are not seen is that the president is not interested in alternative forms of energy. He talks a good talk, but lets face it, we went into Iraq to steal their oil, and this theft makes it only necessary for Bush to talk like he is for alternative energy. He really is for control of the world’s oil and monetary machinery. Blood for oil makes it less necessary to have a policy that makes us less dependent on foreign oil. We just grab the reserves by an illegal war for our oil companies. I am always amused when economists justify a command economy with talk of “paying” for tax cuts as if the government produces and out if its big benevolent heart passes out pieces of its production to the masses. There are some of us who actually believe that it is the people who produce and the government should actually have to justify and pay for the production it confiscates through taxation. If government services are not more efficient than the same private sector services then the government wastes the production of the people by using the confiscated production for purposes other than satisfying the wants and needs of people. I guess it is more convenient to start from the assumption that everything belongs to the king and not his serfs (with apologies to Hayek). It is also amusing that just as capitalism is required to exist to pay for socialism, supply side will never go away because it is necessary to pay for demand side policies. How can I say such a blasphemous thing? Just tell me if you would rather have a dinner produced by a farmer or a plate full of debased currency provided to you by a bureaucrat. As with many other divisions, the use of the term [Postmodernism] is subject to the lumpers and splitters problem. DickF: I am happy to amuse you. Just to clarify — there are some of us who believe that expenditures on law and order and national defense and R&D have a net marginal social benefit. There are even a few that believe that investment in public infrastructure is a net plus to society. On “supply side”, I think you’ve set up a straw man. Economists agree with the notion that incentives matter. The question is whether the labor supply responsiveness to marginal tax rates is sufficiently high to elicit an increase in labor tax revenues when tax rates are reduced. A similar query applies to capital. The empirical evidence is that these elasticities are not sufficiently high. If your post is taken to its logical conclusion a 100% tax rate would be the order of the day. Even socialist and Fascist command economists recognize that such a tax structure pushes production into the black market and virtually eliminates tax revenue. And even the most libertarian economist recognizes that there is a return on some government service such as expenditures on law and order and national defense. That is not the question. It should be the responsibility of government economists to PROVE that a new program is cost effective before the program is instituted. Then government accountants should be required to issue a return on investment to prove that they met the projections. This should be a requirement for every spending bill. The government should demonstrate how it will pay for tax confiscation, rather than requiring the taxpayer to find another source of revenue to justify a reduction in his taxes. Government should become more efficient per capita over time and as the population increases just as a business must constantly become more efficient with an increased customer base. National defense including Veterans benefits accounts for, $606,353 million, or 22.3%, of our total 2006 budget and that includes many social programs that have virtually nothing to do with national defense. Social Security, Medicare, and Medicade account for $1,090,061 million, or 40.2%, of our total 2006 budget. Do you feel that these social programs are worth twice as much as our national defense? The 2006 Department of Commerce spending was $6,374,421? How much of a return did we receive from this expenditure? On “supply side”, I think you’ve set up a straw man. Economists agree with the notion that incentives matter. I may be beginning to see a little of why we have a difference. Supply side is not about incentives. Let me speak to those who are searching for an understanding of supply side. An incentive (or punishment) tax system is Keynesian social engineering. If you wish to understand supply side you must see where the government puts wedges in the economy that prevent the market from creating supply. Supply side is simply about removing those wedges. Don’t think of supply side as daddy giving his son a lollypop so that he will be nice. This is the view the popular press presents of supply side. It has a Keynesian foundation. Think more in terms of supply side as cleaning sand and crud out of an engine so that it will run properly. That approach will help you to understand the difference between a supply side tax cut and a demand side tax cut. All Presidential Candidates should make pledges like those below. If they refuse, then you should refuse to vote for them. 1. No More Oil Wars. 2. Work for independence from foreign oil on day one. 3. No more wars for corporate profit. 4. No more secret deals for $4 per gallon gas. 5. No more Chicken Hawks promoting wars of choice when they themselves avoided combat. 6. Make government green–if you can’t make what you have the most control over green, I don’t care about your plans to make the country green. 8. No more lying about torture. 9. No more re-defining torture. 10. No more drunken hunting. 11. No more secret deals with big corporations to divide up the spoils before the war even starts.